What better way to close out 2013 with a perpetually ripped-off “Best Of” list that is becoming a tradition in these parts. A total of 14 new stadiums were visited this year and there was one for each month except December. The number of local stadiums remaining within a 3 hour drive is dwindling so more spaced out road trips are likely over the next few years. I’m really in a lucky spot as so many big cities and weekend road trips are drivable from Northwest NJ. Without further ado, let’s wrap up the past year! Favorite New Stadium: PPL Park……Location, Location, Location. Well, let’s re-phrase that: View, View, View. While Chester, PA is not exactly a top place to visit, they placed this soccer-specific stadium in a spot that makes for a terrific backdrop. Sitting on the south-side stands gives the crowd a look at the towering Commodore Barry Bridge, with the Delaware River running underneath. 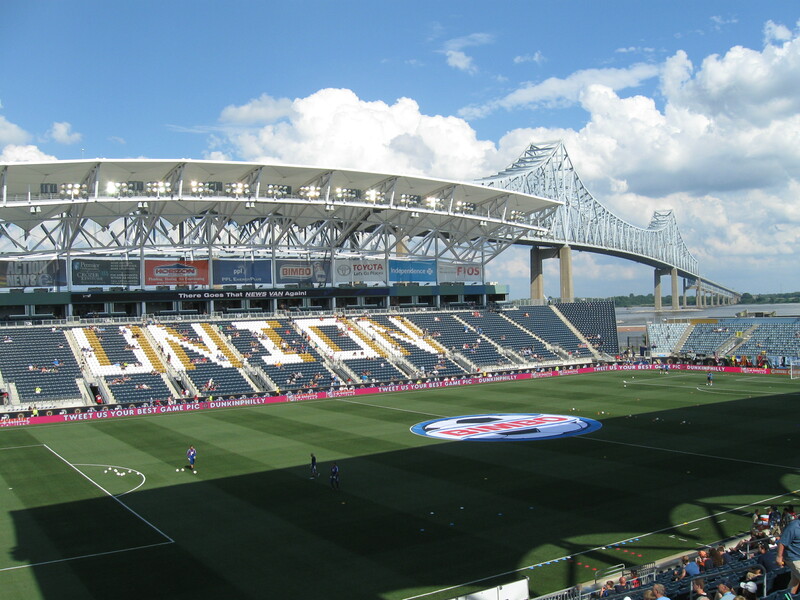 The stadium design along with great fans and an awesome supporters section in the Sons of Ben made the home of the Philadelphia Union a personal favorite. Highest-Rated New Stadium: Camden Yards (Ranking: 89.0)……Holy crap, I never thought I would see a stadium approach a ranking of 90. Out of the 144 stadiums seen thus far, Baltimore’s gem is the highest rated by 4.5 points. It is amazing that after 21 years, Camden Yards still shines as one of the best and even though it is a ballpark that is overly replicated, the original still amazes. I had a hard time gauging the atmosphere as my Saturday afternoon July game was decent, but the buzz seemed to be lacking on TV games I saw during their pennant race. Regardless, everything else about this ballpark is near perfect. Worst New Stadium: Yale Bowl……One word: Splinters. I won’t blast this place more than I already did, but for all the history and nostalgia, I just couldn’t get past what a crumbling and uncomfortable stadium it is. If you want to see historic Ivy stadiums, stick with Penn or Harvard. Favorite New City: Hanover, NH…..Try to imagine the quintessential New England town and you have Hanover, which straddles the central New Hampshire-Vermont border. Rolling hills, a flowing river and nearby mountains combined with an October afternoon made for an amazing visit to the small town. It is home to Dartmouth College and I thoroughly enjoyed the afternoon of football watching the Big Green at Memorial Field. Walking Main Street is a must, as is stopping to eat at the one of many charming eateries. Number of Venues Built in the 1920s: Three…….I love old stadiums and though I may not have liked Yale Bowl, the other two I saw were much better. Rose Hill Gym is the oldest college basketball arena in the country and Fordham’s home is quite unique with that odd sideline balcony. Very cool stone structure to see from the outside and the old bandbox may have been cramped, but the New Yorkers in attendance made for a good atmosphere. Memorial Field in Hanover also goes back to 1923 and fits that town and campus very well. Best Food: Little Poland Festival…..Rather than go with one restaurant, it was a sampling that won this award as my visit to New Britain, CT featured a surprise festival. The city has a huge Polish community and I was looking to try one of Little Poland’s fine restaurants (Cracovia). Instead, I stumbled on a festival where I tried some delicious (and cheap) food that included Pyzy and Kotlet Schabowy. New stuff to me and very good! Best Game: LaSalle vs Manhattan…….A completely last-minute visit brought me to the north side of Philadelphia as college basketball season began and my thirst for hoops returned. I didn’t expect a classic, but it had the makings as this was the Explorers first home game after their Sweet 16 run last year. Meanwhile, Manhattan on paper looks to have a contending MAAC team. The game started off slow in toasty Tom Gola Arena, but it picked up in the Second Half. Manhattan started to push the lead, but down ten with four minutes left, La Salle fought back and Tyrone Garland nailed a three with 13 seconds left to tie the game. It went into Overtime and this time, it was La Salle’s turn to blow the lead. With the Jaspers down three, they pressed the Explorers into a turnover and the ensuing lay-up cut the lead to 1. After split success at the line on the other end, Rhamel Brown tied the game with seven seconds left and we would go to Double Overtime! In that session, it was all Jaspers and they went back to Riverdale with a 99-92 win. Biggest Bonehead Move: Taking the Wrong Passport……Those that know me understand how detail-oriented and schedule-driven I am. My brother is the opposite. Roles were reversed in a recent trip to Canada and about 2 minutes before reaching the border crossing, I saw my wife’s picture in the passport I was holding. A wave of panic ensued as I realized I grabbed the wrong one. What an idiot. Thankfully, I was able to continue the trip and return safely with Real American playing in my head when reaching back on US soil. Best Drive: I-91 from Springfield to Hanover…..I already chronicled how much I loved Hanover, but the drive to get there was very pleasant. Hardly any cars on this interstate and with the leaves changing it was a very scenic trip. Pretty much no worries on this road, however be aware in the winter as snow is frequent in this neck of the woods. Worst Drive: Lincoln Highway (US-1) in Philadelphia…..There just is no good way to get to LaSalle University and I opted for the I-95 route, which led me to the Lincoln Highway. It was my first time on this road and I didn’t realize the pseudo-highway was filled with stoplights and an odd adjacent service road the whole way. It was full on a Saturday afternoon and the stop and go was quite aggravating. Best Side Trip: National Museum of American Jewish History…..This is a relatively new museum in the Old City portion of Philadelphia and before heading to the Liacouras Center for a Temple game, we spent a few hours here. Easily, the whole day could have been used up in this museum and it really is a wonderfully done chronicling of American Jewish history with interesting, informative and powerful exhibits. It was especially impactful on my wife, who is Jewish, and the both of us enjoyed our time here. Highly recommended. Best Return Visit: Nassau Coliseum…..There were a whooping 8 stadiums that I made a return visit to this year and this was a very close call between Nassau Coliseum and a personal favorite, Jerry Uht Park in Erie. But in the end, it is that old building in Long Island that gets the win. I will never forget the noise I heard on my second game in a month for the Islanders-Penguins Game 3. Deafening is hard to describe it and they just don’t make places like this anymore where the crowd is most certainly a factor. It may be remarkably cramped and outdated, but the sightlines are the best and it is the loudest building in the NHL when fans actually show up.